The eggs are good, but nothing spectacular. Raising chickens for the majority of my childhood spoiled me with breakfasts of eggs harboring the deepest orange-colored yolks and the occasional double yolker— well, more than occasional for the legendary Elaine, a white leghorn hen that, if I remember correctly, would lay a double yolker almost weekly. Roosters are apparently mingling with the hens in Thailand, and the candling process for the eggs not effective, as I have come across more than a couple developing embryos after cracking an egg into the pan. Mai bpen rai (no worries)— my childhood morning breakfasts afforded me many opportunities to learn to use a spoon to scoop these bloody little dots off the egg before it started cooking. It’s not that I couldn’t handle eating it; I did manage to down a 15-day-old developing duck embryo (balut) during my time in Vietnam. My Vietnamese couch-surfing friends assured me that it would do amazing things for my health. We are what we eat, after all— right? Scooping these little guys out is something I’ve always done— I suppose it’s just habit. I cook the eggs in aluminum pan I purchased in my first week while at the center (220 baht) and remember thinking I was so clever finding a pop-up hardware store that sold everything brooms to temple offerings (there are many of these shops around— I just wasn’t looking hard enough at first). No matter how much cooking spray I coat it with, the egg always sticks and the yolk, without fail, breaks. The loose bolts attaching the handle to the pan combined with my unreliable cooking spray makes using a spatula a necessity. In college, I used to order an omelet everyday for lunch. Ms. Nikki had flipping those eggs down to a science—something I’ve always tried to replicate outside my consistent Newell Dining Hall visits. I have still yet to do so here in Thailand. My Thai co-workers find my traditional American breakfast odd. Thailand has no specific foods for breakfast— all food can be breakfast, lunch, or dinner! Occasionally I’ll walk the twenty meters up my soi to one of the several Islamic restaurants I frequent to have a bowl of khao soy (northern Thai coconut curry soup with egg noodles— arroy mak! (very delicious)— one of my favorite dishes in Thailand. My favorite khao soy spot is a ten-minute motorbike ride away and is way too much effort to get to in the early hours of the morn. With eggs on my plate, I grind salt from a McCormick grinder to give them that perfect flavor. I was surprised to see such a selection of Baltimore’s own McCormick Spices at the supermarket—-even a few tins of Old Bay! The humidity in the air has gotten to the salt in my grinder, forcing me to occasionally grind for over a minute to get a few grains on my eggs. Even having been in Thailand for six months, the salt grinder remains over three-fourths full. So much salt left to grind while I’m here, so little time. 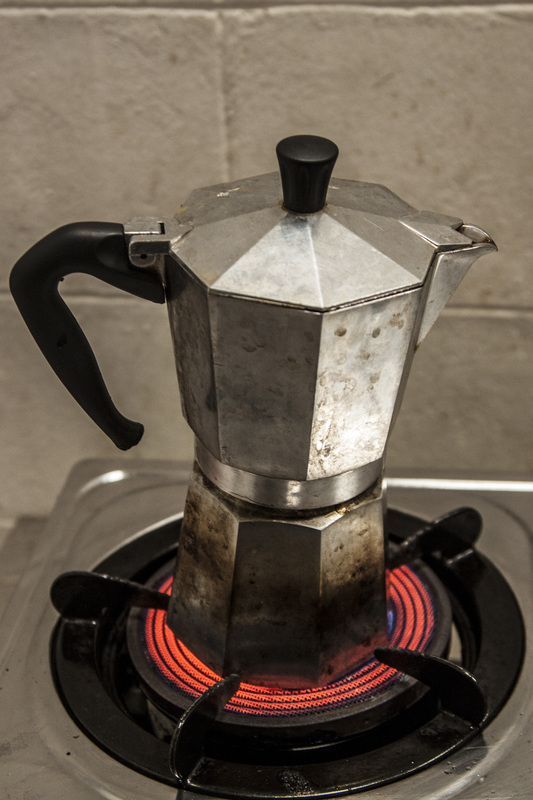 I sit down at the table in the large entrance room to the Urban Light center, placing the Moka Pot (now half full) on a wooden cutting board while I finish the first cup of coffee from the morning’s brew. I’ve left my mark on this table. 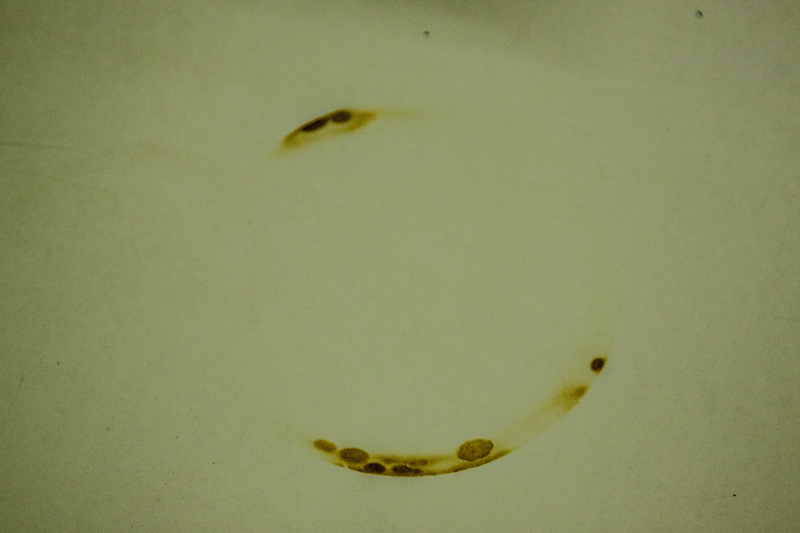 A circular burn remains on the edge of it, a testament to my absent-mindedness in the mornings, especially before drinking coffee. Everyday occurrences such as these has earned me the affectionate Thai nickname of som sam (translated as “clumsy). 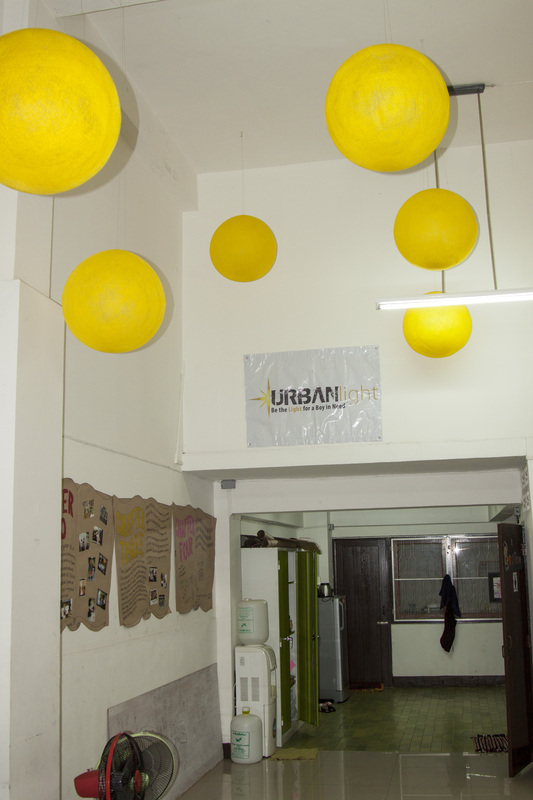 Large yellow balls dangle from the ceiling, giving the room a fun and immediately welcoming atmosphere. I open my fully charged laptop (I never imagined I would be a laptop person) and get on Facebook, curiously clicking the red notifications in the right hand corner of the page. My friends and family from different time zones have commented on or posted something to me while I was sleeping—– the world really does seem a lot smaller now and in constant motion. Of course I have always understood the passing of days as a continuous process of the earth circling its axis, but never has this continuum of existence seemed so apparent. Facebook allows us to see each other’s worlds so closely, and I don’t really feel far from home too often. Virtual existence is no substitute for anything face to face, but it has made the cultural shift less overwhelming, though perhaps for some, it can be a hindrance to cultural integration. Lively entrance room to the center. 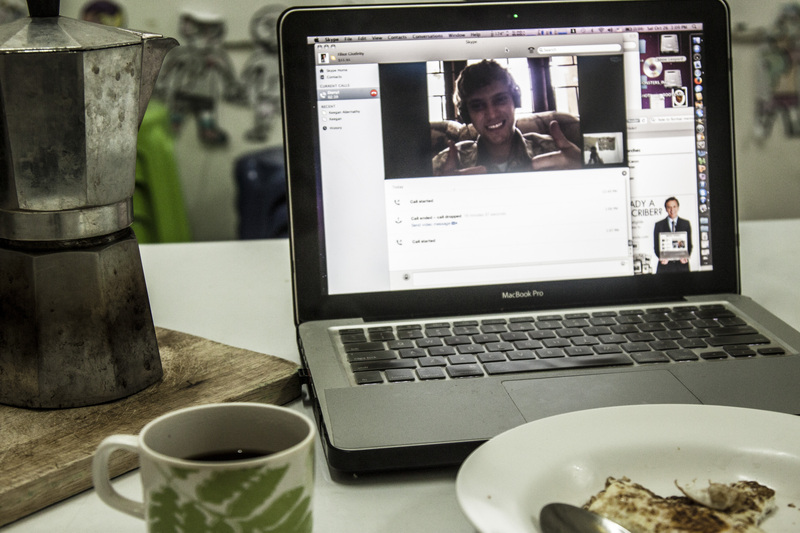 Someone usually joins me for breakfast on Skype— brother, sister, mom, dad, friends, aunts and uncles— it’s nighttime back home and they are on their computers too. The eggs are gone in a few bites, but I will occasionally make my conversation partner jealous with some gâeo mang-gorn (dragonfruit)— the red variety is more impressive on the screen, but surprisingly less waan (sweet) than its white cousin. I resisted for the longest time buying dragonfruit in the market because it was way too expensive. Well, at least I thought it was, presuming each cost 50 baht from the sign adorning the fruit stand— the Thai characters on the sign actually indicated 50 baht per kilogram, certainly a much more reasonable price. It’s worth it too, especially with all of the fiber and antioxidants— we are what we eat, after all—right? My 300baht/day ($10) budget does not go far when I buy produce, but it’s something to savor for sure. Khem, our house manager and five-star chef (her daily lunches are AMAZING), is the first to arrive at the center, usually around 10am. She begins lifting the side security door, alerting me she is there, and begins un-hatching the main security door as I rush over to assist— it is a little more tricky to do than one might think. The door’s screech echoes in the center and is in serious need of some WD-40. The other night my elderly neighbor from across the soi approached me as I got off of my motor bike and began asking me (in Thai) first, if I spoke Thai, and second if I could close the security door more slowly at night, as it always wakes her up. I’ve attempted to honor this request but the door’s painful cries only seem to be prolonged by the protracted decent to the ground. No complaints since our brief conversation, but I think of my neighbor rustling in her sleep every time I lock up the center at night and secure the heavy door. Khem always brings a big smile to the center and her English is improving everyday. We usually have a brief conversation in Thaiglish about how each other’s night or weekend was. Around 10:40, I have usually finished up any Skype conversations and there will occasionally be a boy waiting to come into the center. The center opens at 11, but it’s rainy season now. I gladly let the early arrivals in and use the computers at the very least. I’m greeted with the traditional Thai wai and sawatdee khrap (hello). The center opens late in the mornings because most of the boys we serve sleep late into the day, especially after late nights working in the bars, a reality that was, at first, hard to wrap my mind around. The main bars that our boys frequently work in are a short walk from the center and easily accessible. As we expand our outreach to new locations (male massage, karaoke bars, and other establishments), we will need to address proximity issues— something we have started to consider from a strategic point of view. I head back to my room with a half-cup of coffee in hand— I’ll finish it after my shower. Over the past six months, I’ve continued to take cold showers, and can count on one hand the occasions I’ve had hot ones during my time in South East Asia. One of the first instances was in Ho Chi Minh City during July at the home where I couch surfed. The family’s house had a solar heater on the roof that dished out consistent hot water during my stay. My brief trip to Laos was another of the few occasions. I’m not complaining about my lack of hot water— I could have easily had a system installed. But just think of how much energy and water I’ve saved over this time period! Quick showers have been a hallmark of my mornings and I’ve made it this far— why stop now? This gives me personal justification for the luxury of using the air con during the nighttime. After my shower, I shave the edge of the scruff covering my chin and jaw with my Merkel single blade safety razor, as keeping a little hair on my face makes me look less like a teenager. It’s probably five minutes before 11 and the rest of the staff are rolling in. I get dressed and put on my wristwatch I received for Christmas last year. My mom read somewhere that I would need a watch while traveling abroad, and as it turns out, in its absence, I do indeed feel naked. There are two or three notches that I use with consistency, but one in particular has received the most abuse. Anyone looking at the wrist-band can see that the fabric has been forced through this notch on more than one occasion. This watch has been through a lot. 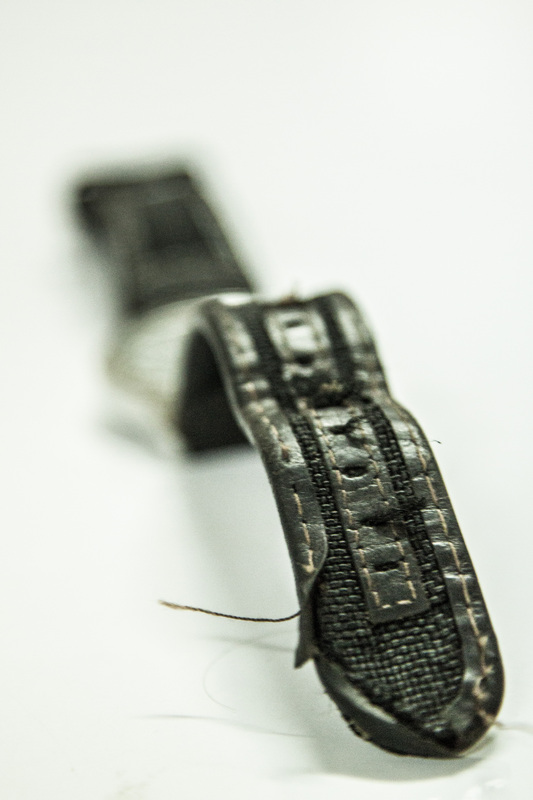 Its glass surface is scratched and the threads attaching the leather border of the band are beginning to separate. But it keeps ticking . . . and ticking . . . and ticking. Persistence is important. Perseverance through the rough times even more so. I brush my teeth and notice that even six months of twice-a-day use hasn’t put much of dent in my toothpaste tube. I really haven’t been here long. How much more toothpaste should I go through before leaving? This entry was posted in Culture, Food, Thoughts, Urban Light and tagged khao soy, Moka Pot, morning, Thai culture, Thai food, Thailand, Urban Light by ejglotfelty. Bookmark the permalink. I went through at least two tubes of toothpaste in seven months, get brushing boy. WOW! I suppose I conserve mine. Teeth are looking good! Let’s see a pic of that toothbrush and what about the floss?? Miss ya man! I’m looking forward to hearing all your stories when you get back. My teeth are clean but i may need a whitening when I get back! Hook me up? 555 Can’t wait to hang out out and play some music together! Miss you buddy! Good to see that you are enjoying the day to day! Take care and God’s blessings! Thanks so much for checking out my blog! You all were a lot of fun to hang out with and I’m so happy to have met you. It’s cool people from all over the world like you that make this trip so amazing for me!